Still on the perspective of the world, we found this artwork entitled “and our world is still alive” by Aminian Tahamtan from Iran as part of the ‘International Posters for peace, social justice & the environment 1965-2005’ show. 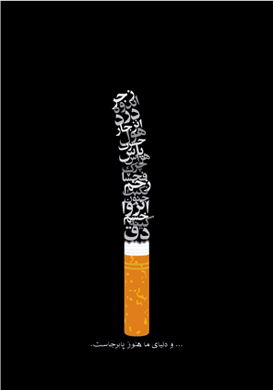 The words forming the ash of the cigarette read from top to bottom: Agony, Sorrow, Pain, Hatred, Hesitation, Envy, Hopeless, Fear, Dirt, Prostitution, Wound, Wretchedness, Madness, Isolation, Wrath, Grudge, and Fatal. The progression begins at the top (the reason for being a smoker) and consequently burns down to the filter (the result of being smoker). This entry was posted in art, design, general and tagged Our World. Bookmark the permalink.